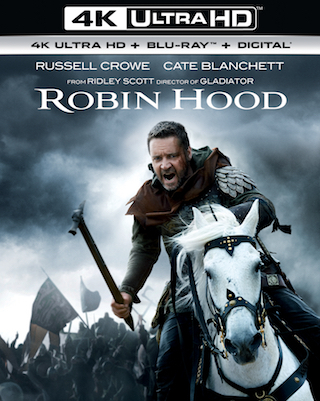 The 2010 Ridley Scott directed film adaptation of “Robin Hood” starring Russell Crowe is coming to 4K UHD Blu-ray on September 11th via Universal. The release will come with an UNRATED Director’s Cut (156 min) of the film, as well as the Theatrical cut (141 min). Tech specs for the release include full 2160p 4K in the 2.40:1 aspect ratio with HDR10 High Dynamic Range and DTS:X sound. This will come in the form of a “combo pack” release with a Blu-ray Disc and Digital Copy of the film included. Bonus materials set to be included on Blu-ray of the release are listed below.